The use of illegal psychoactive substances (IPS) in Canada persists despite ongoing efforts to limit their consumption. Criminalization of those who use these substances remains the principal tool to control their use and is unsuccessful. An alternative approach – a public health approach – is required. Such an approach is being used to manage the ongoing opioid crisis through amendments to the Controlled Drugs and Substances Act and other related acts, including renewal of the Canadian Drugs and Substances Strategy. The amendments provided a simplified approach for obtaining permission to establish supervised consumption facilities while the Strategy renewal reintroduced harm reduction as a pillar. Similarly, the Good Samaritan Drug Overdose Act provides an exemption from charges for simple possession of a controlled substance, as well as charges concerning pre-trial release, probation orders, conditional sentences and parole violations related to simple possession for people who call emergency services or are on scene when help arrives for those suffering from overdose. The Canadian Public Health Association (CPHA) encourages provinces, territories and municipalities to implement similar measures in their jurisdictions. Furthermore, CPHA recognizes and supports the right of Indigenous communities to respond to psychoactive substance use according to their traditional justice and/or cultural protocols. A public health approach is also being promoted for the legalization and regulation of cannabis and its related products in Canada. CPHA commends the Government of Canada for taking these actions and urges the continued expansion of this public health approach to manage all psychoactive substances that are currently illegal, as described in CPHA’s 2014 Discussion Paper. Central to this action is a reduction of the legal barriers which cause harm to individuals who use drugs. Such an approach could be similar to that currently in use in Portugal, as described in Appendix One. Provide expanded evidence-informed harm reduction options that include, for example, improved access to supervised consumption facilities and drug purity testing services. In Canada, a 2015 survey showed that over 12% of all adults, 21% of youth aged 15 to 19, and 30% of young adults aged 20 to 24 had used cannabis during the past year, while 2% of the population admitted to past-year use of at least one of five illegal drugs (cocaine or crack, ecstasy, speed or methamphetamines, hallucinogens or heroin). This amount represents an increase from 1.6% of the population in 2013, and was a result of an increased use of hallucinogens and ecstasy. The estimated cost associated with this consumption was $8.2 billion in 2002, with $148 million being directed to prevention and research, and $5.4 billion associated with law enforcement.6 Current consumption costs are difficult to estimate as there is limited recent economic analysis concerning this issue. The use of illegal psychoactive substances, however, has become increasingly problematic as demonstrated by the current (2016/17) opioid crisis, the availability of increasingly harmful synthetic products, and the expanding misuse of prescription pharmaceuticals. 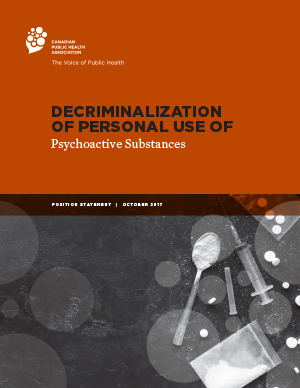 These ongoing challenges demonstrate that criminalization does not reduce the likelihood of illegal psychoactive substance use, and often results in stigmatization and other harms to those caught in possession of small amounts of substances for personal use. The effect of this criminalization often does not reflect the severity of the crime. For example, the current structure of fines and incarceration causes most harm to those at the lower end of the social gradient, which results in greater health inequity. Similarly, incarceration presents barriers to re-entry into general society, and increases a wide range of challenges from employment (thereby reducing that person’s economic potential) to housing (that can directly and negatively affect health and well-being). Furthermore, these approaches have been demonstrated to systematically perpetuate socio-economic harm, especially against racialized communities. The alternative to criminalization is a public health approach that seeks to maintain and improve the health of populations based on the principles of social justice, attention to human rights and equity, evidence-informed policy and practice, and addressing the underlying determinants of health. Such an approach places health promotion, health protection, population health surveillance, and the prevention of death, injury and disability as the central tenets of all related initiatives. These actions are based on evidence of what works or shows signs of working, and are organized, comprehensive and multi-sectoral. This approach finds its basis in the Canadian Charter of Rights and Freedoms* as well as several United Nations (UN) agreements†. Opportunity costs of allocating resources into law enforcement, judicial and correctional/penal approaches with consequent scarcity of resources for public health and social development approaches. It is also recognized that criminalization contributes to the promotion and acceleration of infections such as HIV and hepatitis C, as the legal consequences and stigmatization resulting from criminalization result in unsafe injection practices such as the sharing and reuse of syringes in unsafe locations. Domestically, provincial and territorial governments are at the forefront of delivering public health services to address illegal psychoactive substance issues, while municipalities such as Vancouver, Toronto, Montreal and others have incorporated public health principles into local strategies. Internationally, several countries have integrated one or more of the cornerstones of a public health approach to illegal psychoactive substances. For example, Switzerland has focused on decriminalization and harm reduction. Norway focuses on upholding human rights and dignity for those who use drugs, while encouraging treatment and abstinence. Australia recognizes the social and health inequities associated with dependence and addiction. The use of criminal sanctions to limit the personal use of illegal psychoactive substances has failed to limit both the number of users and the products available to them. The available evidence supports the benefits associated with a public health approach and its capacity to reduce harms. This approach is predicated on decriminalization of the personal use of psychoactive substances, availability of administrative processes for addressing use, and strengthened enforcement of laws concerning the production, sale and distribution of illegal psychoactive substances. * Section 7 of the Canadian Charter of Rights and Freedoms provides for “…the right to life, liberty and security of the person and the right not to be deprived thereof except in accordance with the principles of fundamental justice. † The International Covenant on Civil and Political Rights; the International Covenant on Economic, Social and Cultural Rights; the Convention Against Torture and other Cruel, Inhuman and Degrading Treatment or Punishment; the Declaration on the Rights of Indigenous Peoples; and the United Nations Comprehensive and Integral International Convention on the Protection and Promotion of the Rights and Dignity of Persons with Disabilities. ‡ These conventions include the 1961 UN Single Convention on Narcotic Drugs; the 1971 Convention on Psychotropic Substances, and the 1988 Convention against Illegal Traffic of Narcotic Drugs and Psychotropic Substances. Portugal has developed a unique approach to the management of illegal psychoactive substances that is based on the recognition that illegal substance use is a health problem. As such, the possession and use of illegal drugs remains illegal, but the sentencing for this use does not result in criminal conviction. The European Monitoring Centre for Drugs and Drug Addiction has provided an extensive profile of the development of drug policy in Portugal. Double public investment in drug fields. Brought alcohol and drug policy closer together. Under this system, Portugal has on average three drug-related overdoses per million citizens, compared to the European Union average of 17.3. Portugal also has a reduced incidence of HIV infection among drug users and less use of so-called designer drugs than other countries, where reliable data exist. Although a causal relationship is difficult to establish, positive tendencies exist between a decriminalization approach and improvement in these health indicators in Portugal.